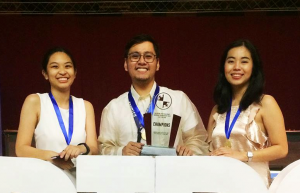 The La Salle Debate Society (LSDS) bagged the national championship for this year’s Philippine Inter-Collegiate Debate Championship (PIDC), which was held last June 8 to 13 at the Asian Development Bank (ADB), Mandaluyong City. All three members of LSDS also bagged other major honors. Kit Albert (IV-Japan Studies and Legal Management), Patrich Lozano (III- Marketing Management), and Marina Lim (III- Development Studies and Management of Financial Institutions), were named Overall Best Speaker, 3rd Best Speaker, and 7th Best Speaker respectively. 120 debaters from 24 schools from all over the Philippines vied for the coveted title. The competition had 7 preliminary rounds and 4 rounds for the final series. Each round had different themes such as education, economics, health, social movements, international relations, powers of the state, religion, national issues, and environment. For the grand finals, the motion debated was about housing and development. The PIDC is the largest national debate tournament in the Asian Parliamentary format.